The Year of the Rooster stamp is the tenth of 12 stamps in the USPS Celebrating Lunar New Year series. The Year of the Rooster begins on January 28, 2017, and ends on February 15, 2018. 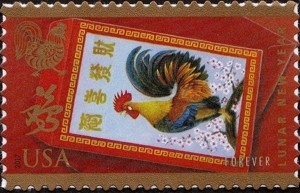 The stamp art depicts a rooster emblazoned on a red envelope (hongbao). Parents present red envelopes containing money to children and loved ones during Lunar New Year celebrations. The color red symbolizes luck in Chinese culture, while rooster imagery is often used to ward off evil spirits. The characters at the top of the envelope form a common Chinese greeting of celebration and wish for prosperity and good fortune, used most frequently during Lunar New Year. In the United States and elsewhere, the Lunar New Year is marked in various ways across many cultures; parades featuring enormous and vibrantly painted papier-maché dragons, parties, and other special events are common. Vendors at outdoor markets sell flowers, toys, food, and other items for celebration. Musicians play drums to celebrate this time of renewed hope for the future.